It might come as surprise to many of you. Finally, book authored by me is available for public on Amazon. (paperback and kindle). Those who follow Vinod’s (b|t) blog have seen this announcement already. 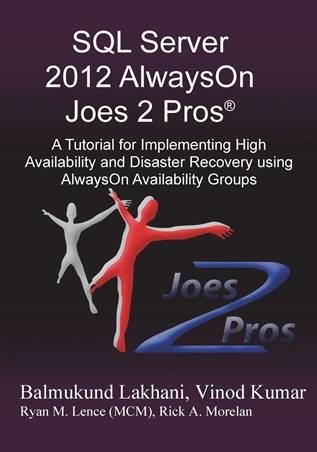 It has been close to an year of writing and multiple reviews, my book on “SQL Server 2012 AlwaysOn Joes 2 Pros®: A Tutorial for Implementing High Availability and Disaster Recovery using AlwaysOn Availability Groups” is finally available on Amazon. A little spark was ignited when me, Vinod (b|t). and Pinal (b|t) were sitting together after a User Group meeting and thinking – what can be done to share the knowledge. Pinal and Vinod were already a well-known blogger and author. I said in feeble voice – I may have some additional knowledge on AlwaysOn, how about a book on this topic? … all of us agreed and journey started. Thanks to Vinod and Pinal for the spark of inspiration to set me off into looking things from different perspective. I wouldn’t have thought to become an “author” without your support. After take off of the project, table of content of 5 chapters were prepared and we have taken task to write everything about the feature. I got my home PC upgraded to better RAM so that I can use my home PC for Hyper-V images which were needed for the book. We targeted 100 page and during weekly checkpoint meeting we always thought “something is missing” … after reaching 500+ pages, we felt that we have covered almost everything about the feature which can bring a starter to intermediate level. Decision was taken to increase the page size and trim down the number of pages without compromising quantity and quality of knowledge. Lots of hours spent on emails, phone calls, chat, internet research, books-online reading, blogs reading to make fine prints. Finally, after an year of hard efforts, book was ready to be published. In paperback as well as kindle version. It feels good when someone meets and says – “You blog helped me in fixing a problem”. Being a part of SQL Server technical support team, I felt that there is not much “organized” content on AlwaysOn feature. I spoke to many folks and sensed a “fear” of this new feature. There are various blogs on the same topic and books online also has lots of content. By writing this book and sharing my knowledge , I feel that I am doing my part for the community which is driven by passionate people and MVPs. I love technology, SQL Server and its features. There were many questions asked and being of a very tidy disposition, I liked to have them answered. That’s why we added a new chapter in the book for FAQs along and there were around 70+ questions. What we have in the book? Here is the crisp summary of the book. Chapter 3. What is AlwaysOn? At this moment we don’t have any other channel to publish this book in India. Our publisher is in constant pursuit to look for alternatives, till then Amazon will the only channel. You can read first two chapters for free on amazon via LOOK INSIDE feature on kindle edition. I truly hope that it would help many DBAs in the world to get started with AlwaysOn Availability Group feature and deploy as high availability + disaster recovery in the environment. 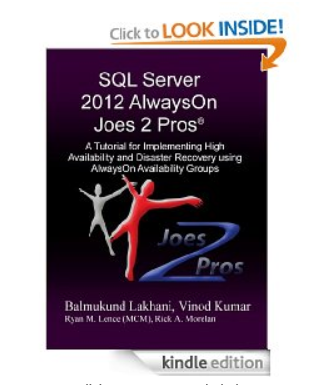 Before I conclude this blog post, I want to specifically call out name of few people from my management team who have backed me in this adventure of learning and sharing via this book – Sri Krishna Jagannath (Team Manager – SQL Support), Rahul Jacob (Team Manager – SQL Support), Xavier S Raj (Escalation Manager – SQL Support), Ranjan Bhattacharjee (Group Manager – Developer Support). It would have been impossible to deliver this book without their unconditional support. Last, but not the least, Special Thanks to my wife and daughter for being supportive through out this journey!